As wireless carriers begin to subsidize computers that come with wireless Internet access, they're faced with a quandary: What do they do if the buyer stops paying his bills? The company can cut off the computer's wireless access, but the carrier would still be out a couple of hundred dollars. The buyer would be left with a computer that's fully usable except for cellular broadband. LM Ericsson AB, the Swedish company that makes many of the modems that go into laptops, announced Tuesday that its new modem will deal with this issue by including a feature that's virtually a wireless repo man. If the carrier has the stomach to do so, it can send a signal that completely disables the computer, making it impossible to turn on. "We call it a `kill pill,'" said Mats Norin, Ericsson's vice president of mobile broadband modules. The module will work on AT&T Inc.'s U.S. third-generation network, and on many other 3G networks overseas. 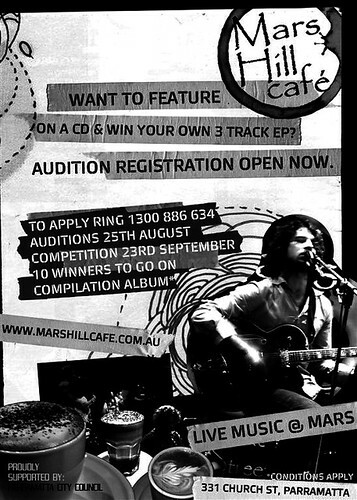 Mars Hill Cafe in Parramatta will be organising and hosting a local music competition that will allow up and coming and established local music acts to perform several acts each in the popular Church Street cafe. They will compete for the chance to record a 3-track EP recording session with 2 tracks from the competition and a third recorded studio style in the performance space. Supported by a grant recently awarded to Mars Hill Cafe by the Parramatta City Council, the 10 best acts from the competition will be recorded and released on a compilation album later in the year.